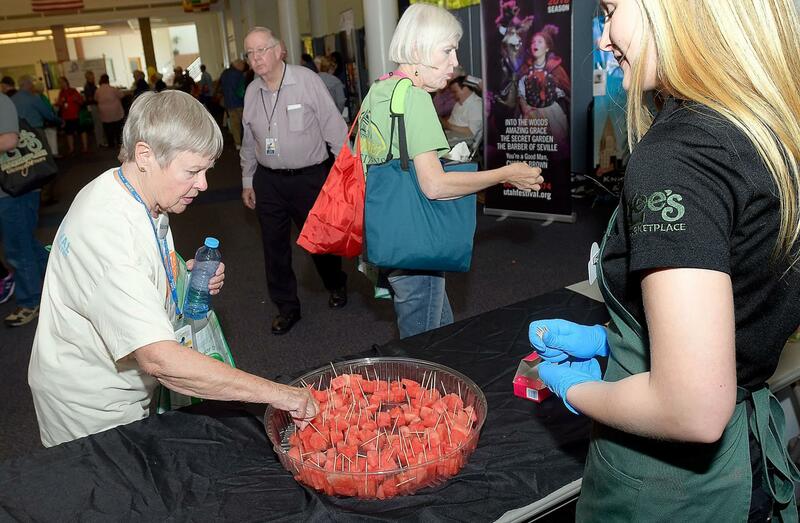 Lee’s Summer Food Show was the first glimpse into the transition to Food Club brand for many of our guests. It is a change that Lee’s believes will give the best selection and value to our guests and we are very excited about it. Here at Lee’s, a lot of care is taken to ensure that our decisions and offerings will have a positive effect on the families and communities we serve. It is not taken lightly and is something we are anxiously excited to share with you, our loyal guests. 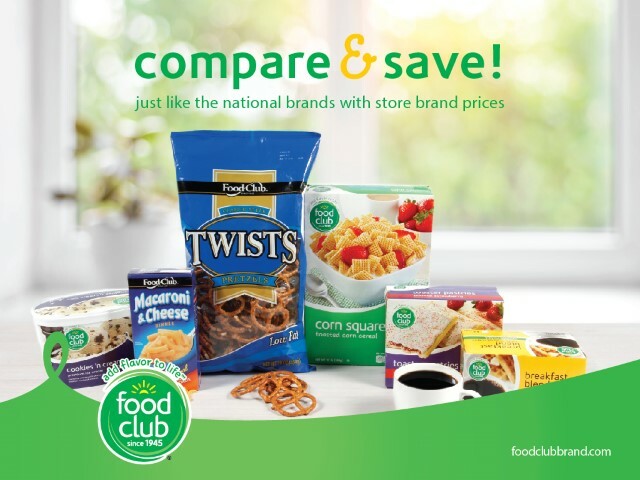 Food Club brand is very well known throughout the country and is used in large retailers predominantly from the Northeast, South, and Midwest. Their expansion is bringing them to stores in the West, such as Associated Food Stores. Food Club is a brand that made its start in 1945, growing and developing over time. It has become a household name as it has grown to carry a large variety of products for all of their consumer’s needs. With over 2,600 items available, buying the exclusive brand has never been easier or better for your wallet. It is a brand that retailers and grocers across the country have come to trust and have pride in. Food Club works endlessly, researching the leading brands and creating competitive products. Keeping up with what consumers are looking for in their products is something done with great care and diligence. Researchers focus on creating products that keep them relevant to the growing trends and need of their consumers. Food Club scientists are constantly testing and formulating their product to always be a higher quality than the industry standards. Many, many hours go into a product before it ever hits the shelf, such as testing, recipe changes, and formula changes, they are able to constantly improve. For example, finding the correct consistency, color, and taste for chunky peanut butter is a very technical process. 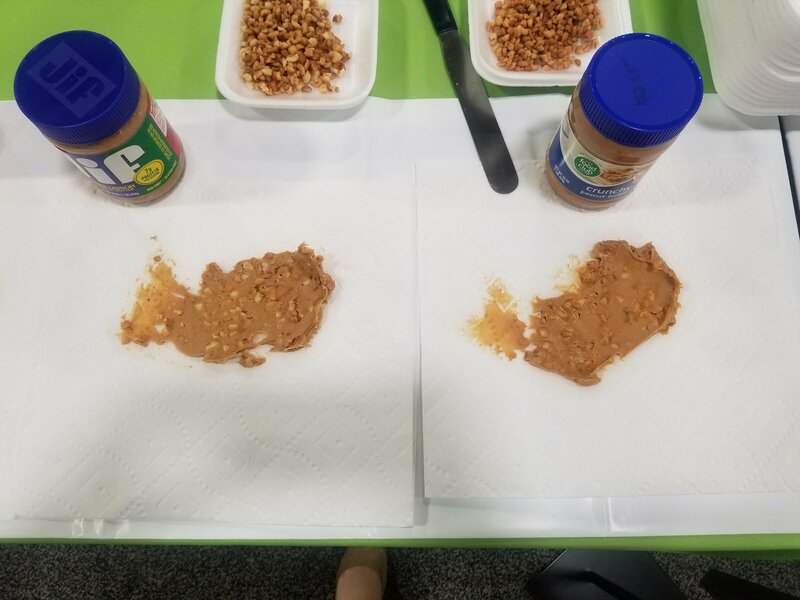 In order to create a product with peanuts in it that is still spreadable, consistent in texture and devoid of air pockets, scientists must diligently alter recipe after recipe. The finished product is something that Food Club is able to take immense pride in. The knowledge and passion for their food is something they are excited about. Their pride in their product is contagious and extremely important to the grocery industry. It makes trusting the Food Club brand with the quality that Lee’s guests deserve, easy. Lee’s has carried Western Family for years, trusting the quality and having the assurance that it is worth carrying for our guests. So many are wondering why make the change? Although we know the transition will take a lot of getting used to, we believe it’s worth it. Food Club is very passionate about their Clean Label initiative. They believe in simpler labels and ingredients you can pronounce, for a healthier, happier family. Creating simpler ingredient lists and labels are just one of the many things that the Food Club brand continually improves and adjusts. Our families are eating much differently than we did growing up, or even before that. Although there are foods we still enjoy, there are also many other items that are new and exciting. 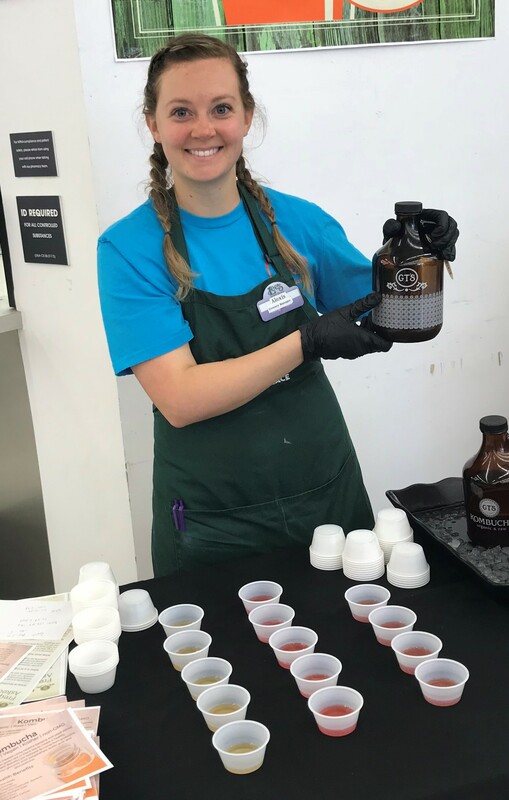 Food Club diligently stays up with the trends, flavors, product lines and varieties that the name brands are offering. 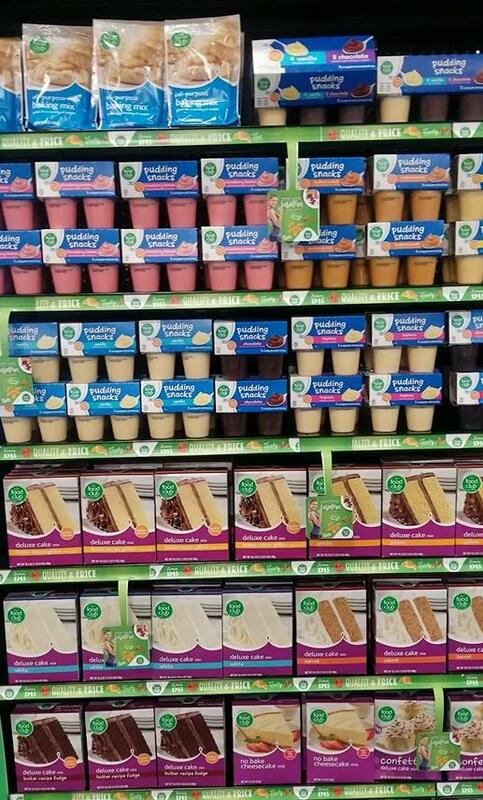 Lee’s is excited and ready to showcase these new items, and we believe that Food Club has our best interest in mind. 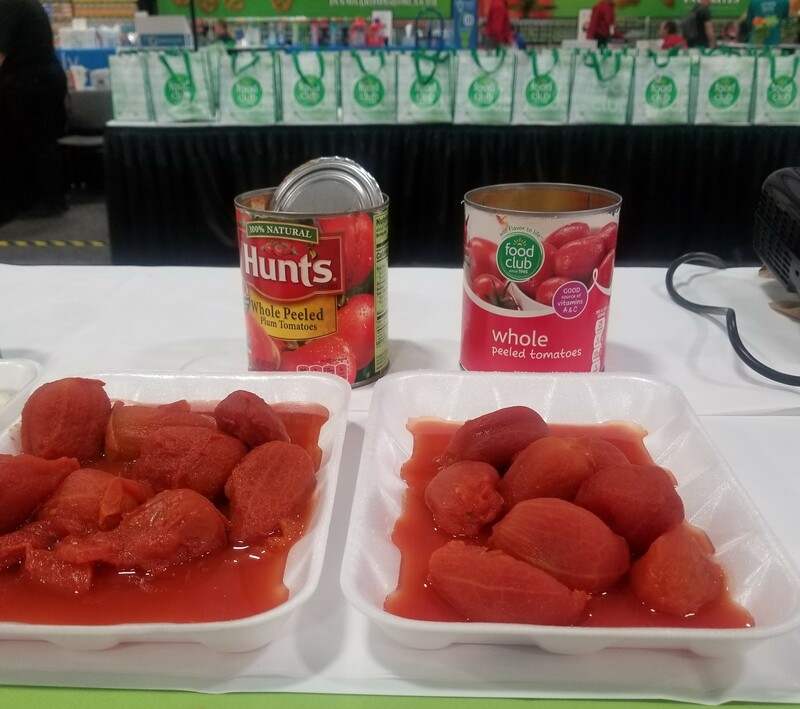 With the support from AFS during this transition, know that this is a large change throughout the grocery industry in many of the western states. The transition will be done over time, helping to keep items from being out of stock in the warehouse or on the shelves. AFS and Lee’s are prepared with a plan that will work for guests, and Lee’s team. Throughout the year you will slowly see the green Food Club label appearing on products you know and love around the store. 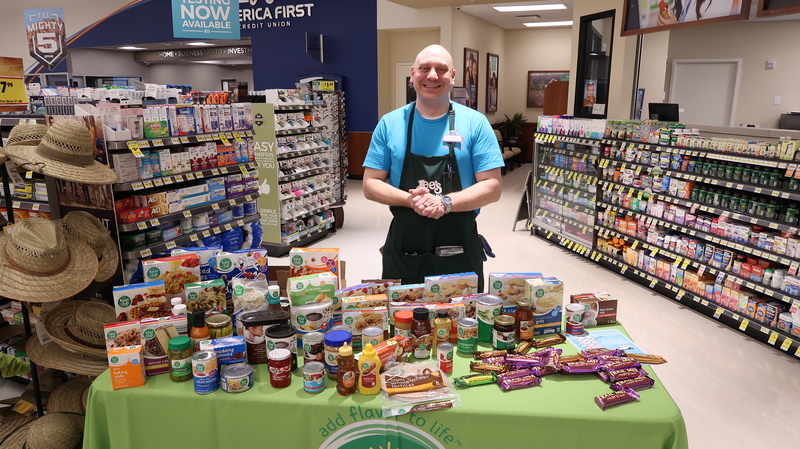 In each of our 5 locations, there is a Food Club champion who keeps an eye on the transition for each department and product. This champion, as well as the management office, will help to coordinate a seamless transition for the product. They are a direct resource and trainer for their fellow team members of the year. The Food Club champion as other team members will be available to answer any of your questions or concerns through the change. The big questions we are all anxious to know are: What is the price difference? How does the quality compare? Will this affect milk, meat, and other perishable items? Pricing will not only be similar to Western Family products, in some cases it will actually be better. With a larger variety of products, in some instances Food Club is able to beat the pricing, offering a delicious product for a better deal. Food Club’s quality standards are extremely high, similarly to Western Family. In many cases they use the same manufacturing plants for their products, delivering the identical product. The products that do differ in location are from plants that are known to be reliable and take pride in their quality. Western Family meats such as packaged breakfast meats, deli meats, frozen meats, and others will transition over to Buckley Farms. They are known for their grass-fed, natural product, and will be a high-quality transition for similar pricing. Overall, it should be a slow and smooth transition to the Food Club brand. Lee’s is excited to carry a high-quality brand, with a large variety of products at a competitive price. Keep an eye out for the green Food Club label coming to your Lee’s location soon. Finally, a three-day weekend the entire family can enjoy; Memorial Day weekend. Although the weekend is full of varying traditions for everyone, there are a few things that stay the same. Good weather, time-off, and a fun time with family and friends. At Lee’s, we completely understand that sometimes the stress of planning and organizing a relaxing weekend can get overwhelming. However, with these lifehacks, your weekend should be stress-free from the start. Lee’s Online is a fantastic resource for you to get the most enjoyment from the good weather and fun times. You can order all of your groceries in a matter of minutes without ever leaving the comfort of your lawn chair. The best part about Lee’s Online is that if you are packing to go camping, road-tripping, or any type of travel, you can get your coolers ready to go while Lee’s Team Members shop and deliver your food. Unload your food directly into your coolers and trunk, and you can take all of the hassles out of those last minute details. When placing a delivery order, keep in mind that delivery slots will close 4 hours ahead. You can also place your order up to 5 days in advance. So, if you are wanting to place an order for 3-5pm on Saturday you can place your order anywhere from Monday-Saturday at 11 am. You can also opt for in-store pickup where your groceries can be neatly packed into your trunk for you. #LeesLifehack: When picking up your Lee’s Online order, currently the best option for making the best use of your time is calling the store when you are on your way. This can give them a heads up to get your order ready. (You can either ask to talk to Lee’s Online Department or let the service desk know). Many of our families traditions for Memorial Day include mums and memorial sprays. Lee’s talented floral designers have been creating beautiful Memorial Sprays for years, supplying only the best flowers that will last. These sprays are designed in store, so all of the orders are completely customizable. They are also available in an array of sizes and colors, allowing orders to fit into any budget. 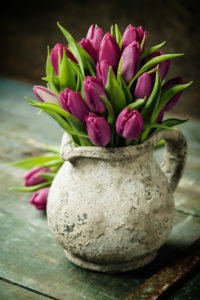 Place your orders early to ensure flowers will be ready for you when you need them. Outdoor Plants by Rudy’s are a huge hit memorial weekend. With an entire weekend that can finally be spent outside, it’s a great time to work on beautifying your lawn. 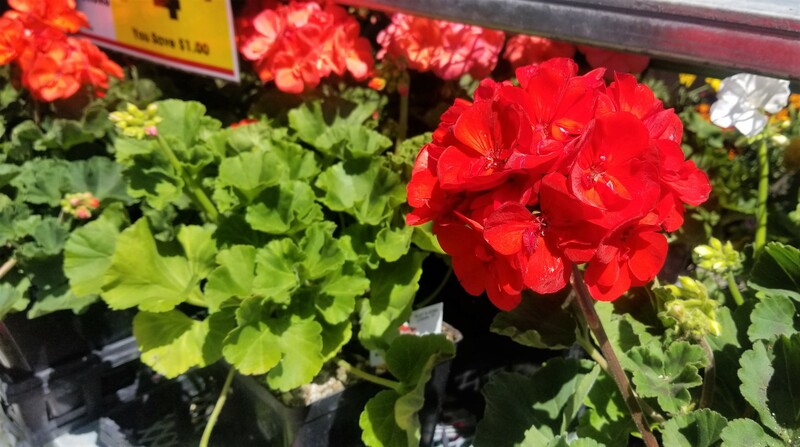 Geraniums, Hanging Baskets, Color Bowls and more are available during one of the final weeks of outdoor plants. Mums. Mums. Mums! 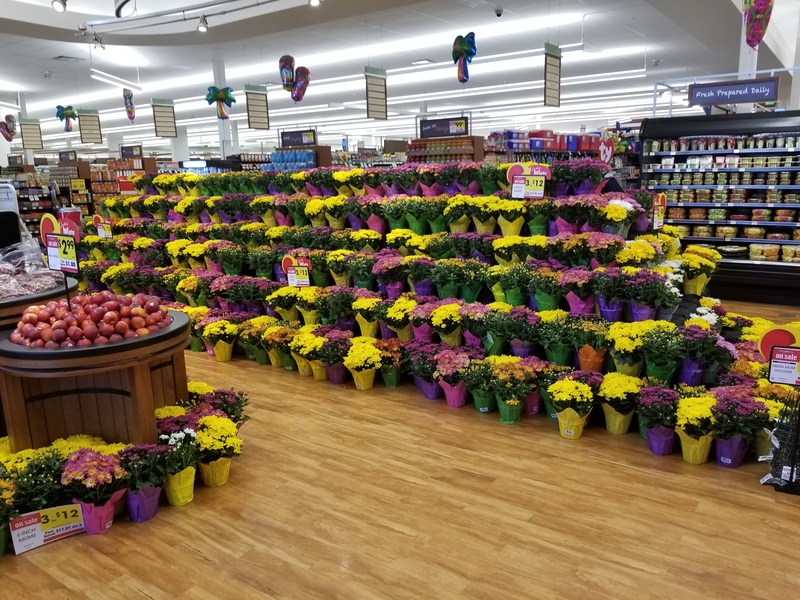 Lee’s floral departments go through hundreds of mums over Memorial Day weekend. These mums are ordered far in advance and care is taken to pick the perfect assortment to be planted. These mums are delivered twice a week, bringing a new variety in each shipment. Don’t put off buying your mums too late, fun varieties sell fast. #LeesLifehack: something that Lee’s does is create fun, custom colors with the potted mums. Florists will spray white mums with flower-safe spray dye to create fun colors and patterns. If you have a design or color you would like, stop by the floral department and ask for a sprayed mum. Memorial Weekend is a great time to bring the family together and share in good food. However, cooking outside can keep heat out of the house and leave for an enjoyable afternoon spending time outside. 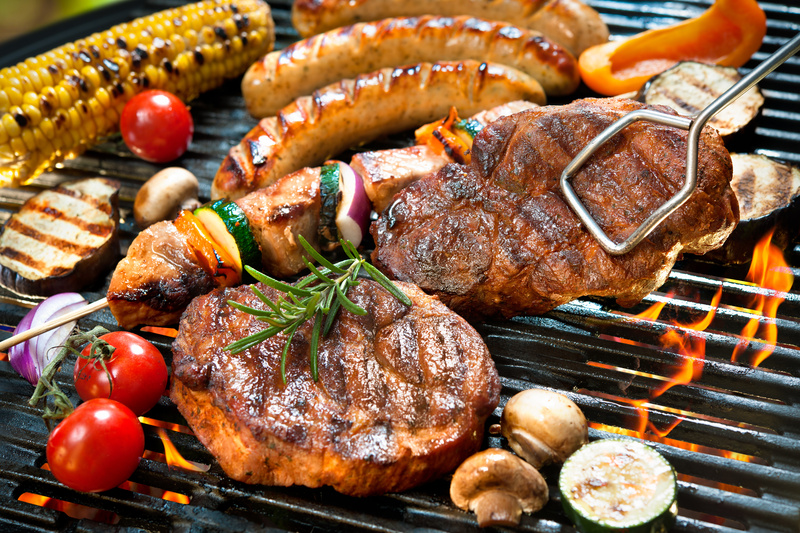 Break your Traeger out of hibernation this Memorial Weekend. Traegers are great for so much more than just grilling. Traegers are a smoker so they can cook delicious meats and meals to any level of smokey-ness. Did you know you can cook anything you cook in an oven in your Traeger? Just adjust the temperature and cook it all. You can cook cookies, pizza, bacon, casseroles, pasta, and more. Lee’s and Lee’s Ace carry all of your Traeger needs. 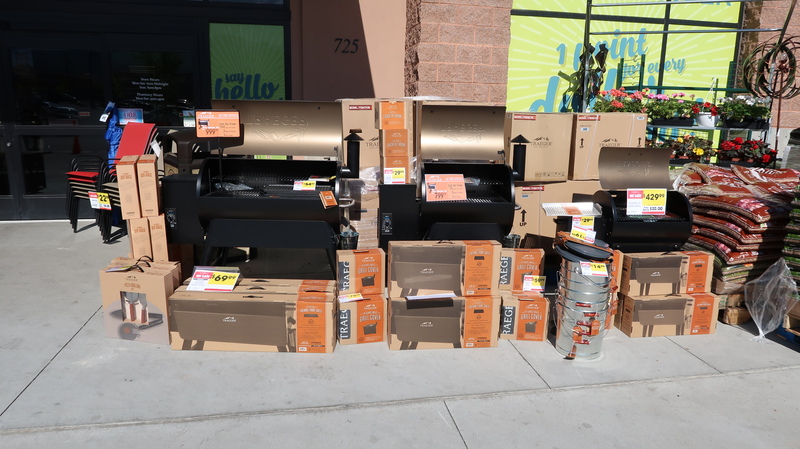 From Traeger grills to pellets, seasonings to utensils, and rubs to covers, Lee’s carries the entire line for you. Order your Traeger supplies through Lee’s online or come in for the best deals. Lee’s carries the best meats in town, we have a butcher in-shop that ensures the highest and freshest quality meats every time. The Meat department makes all of the bratwursts in store with a special array of seasonings and spices. Try one of the many flavors or go with Lee’s Signature hamburger patties for a family favorite. 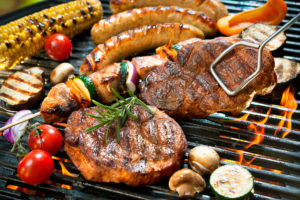 Don’t forget about the delicious steaks, chicken, seafood and more, all grill friendly. The bakery also supplies amazing made-from-scratch buns. 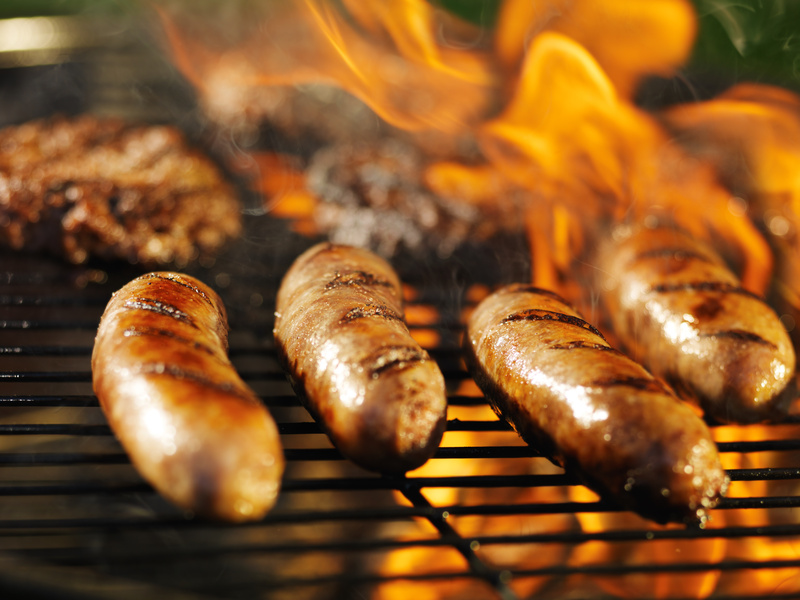 Pair one with a delicious brat from the meat department to be the talk of the town. Don’t forget to swing by the deli department and grab some delicious salads for your dinner. From party subs to potato salad, Lee’s deli can help you create the perfect lunch for your family and friends. Memorial Weekend is also a great weekend to take advantage of great sales on soda and chips! This is one of the first good weeks of spending lengthy outdoor time, and there is a chance you may have lost some of your outdoor essentials. Not to worry, Lee’s carries them all. 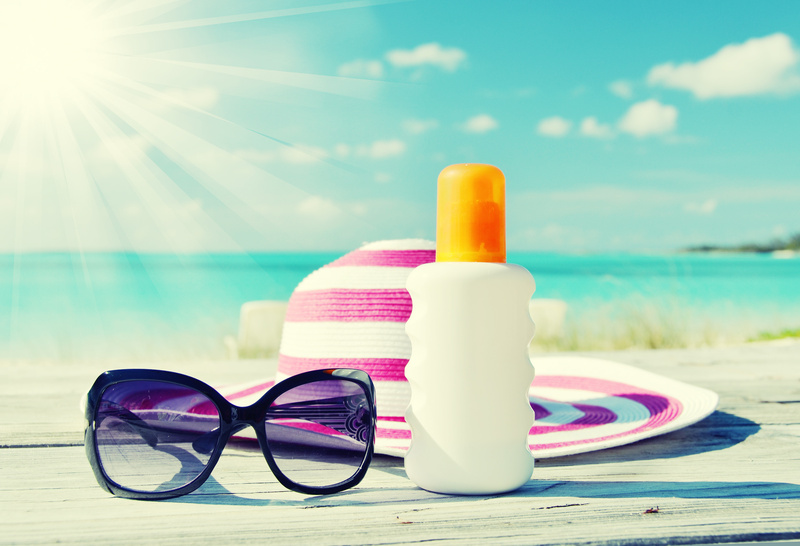 You can get sunscreen, aloe, fire pits, tents, umbrellas, chairs, coolers, roasting sticks, mosquito repellent and more. There are also fun things for your kids available. You can get bubbles, kids toys, shovels, bug nets and containers, and various other things to entertain your kids for hours. Lee’s is your one-stop-shop for Memorial Day shopping! And the great thing is with Lee’s Online, you don’t even have to “stop”! One last thing: Don’t forget the ice! We’ve all done it. We have put off getting necessary things done to be healthy for the sake of money and time. Sometimes, the procrastination is to stave off entertaining your kids in a waiting room, and the thought of that can be daunting. What if there was another option for some of those overwhelming tasks on your to-do list? 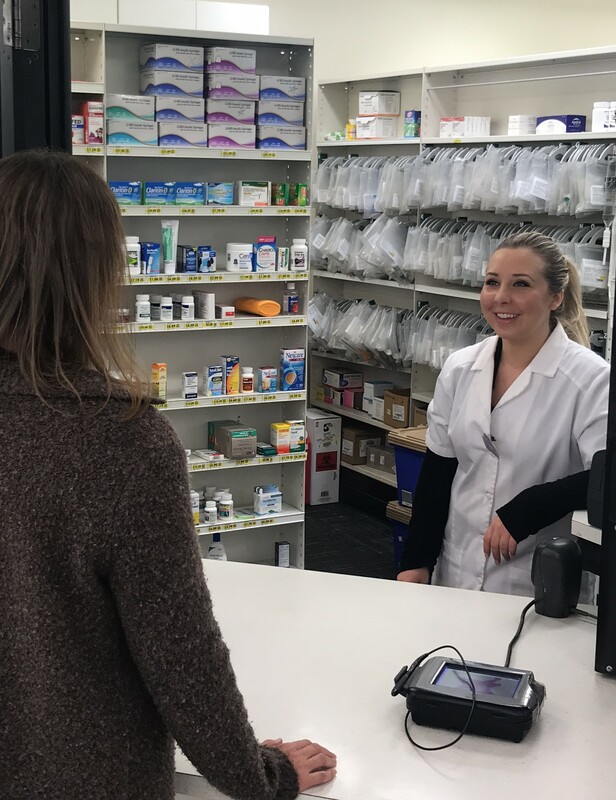 How would you feel about taking care of your family’s health while saving time and money by utilizing the pharmacy services at Lee’s Marketplace? Of course, you would be ecstatic! Well, here are 5 lifehacks that you may not have known were available at your Lee’s Pharmacy! There are currently three different tests available at Lee’s Pharmacy currently, and they are all $30. Probably the best lifehack is the strep testing. This is available for everyone over 4 years old, and if you test positive, the pharmacy can dispense an antibiotic right there. Done! 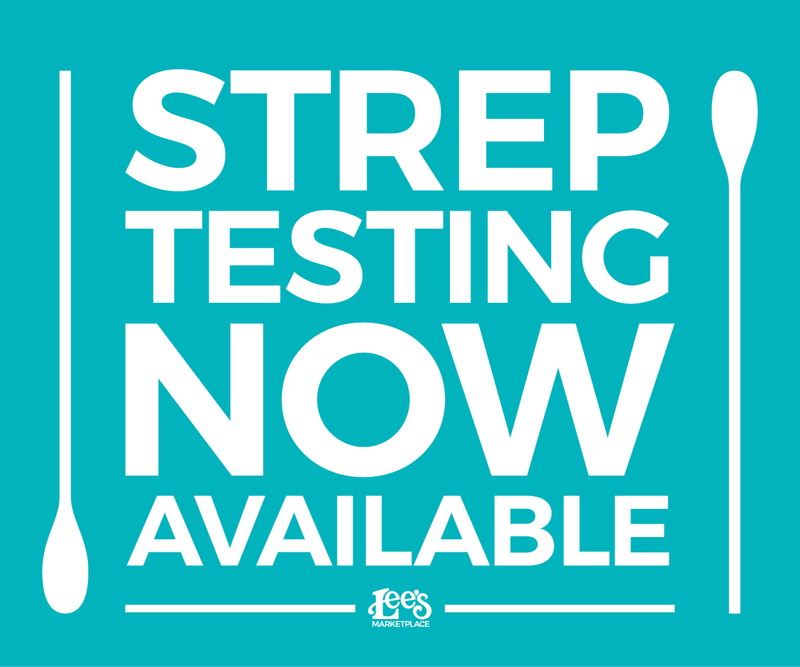 This means that while you are grocery shopping you can save time and stress while multi-tasking and getting your strep test done. No need to make an appointment or sit for hours in a waiting room. You can come in when it’s convenient for you and all for a cost that is cheaper than an average co-pay. How do you know if your cholesterol or diabetes medicine or all of that extra exercise you’re doing is helping to lower your cholesterol and blood glucose levels? Lee’s Pharmacy can do a full panel Cholesterol Test that breaks down total cholesterol and HDL ratio, LDL, and triglycerides levels in order to give you the best information about your health. Also, Diabetic patients can get an A1C test done at the pharmacy, all while grocery shopping. Trying to get kids to go to the doctor’s office, especially while they are at the age of vaccines and shots can be stressful. It can mean wrangling them into a waiting room, trying to keep them calm, and finding time to schedule an appointment in the first place. If you have kindergarten registration coming up, keep in mind that all of the vaccines can be done at Lee’s where your kids are already comfortable. Anyone over 3 years old can get vaccines at Lee’s and the pharmacists have access to be able to see which vaccines you need, which ones need a boost, and which are fine. 3- Lee’s Pharmacy offers a free MTM (Medication Therapy Management). You can set up a review time with your pharmacy and can go over the medications that you have. Although the doctor’s office can help manage these, sometimes there are issues the pharmacist is in a unique position to see. In the review, if the pharmacist sees any issues with your prescriptions, they will work directly with your doctor to solve and work through the problem. When trying to remember if you have taken all of your medications, or simply trying to remember if you took your morning dose, pharmacy blister packs are a helpful life hack. 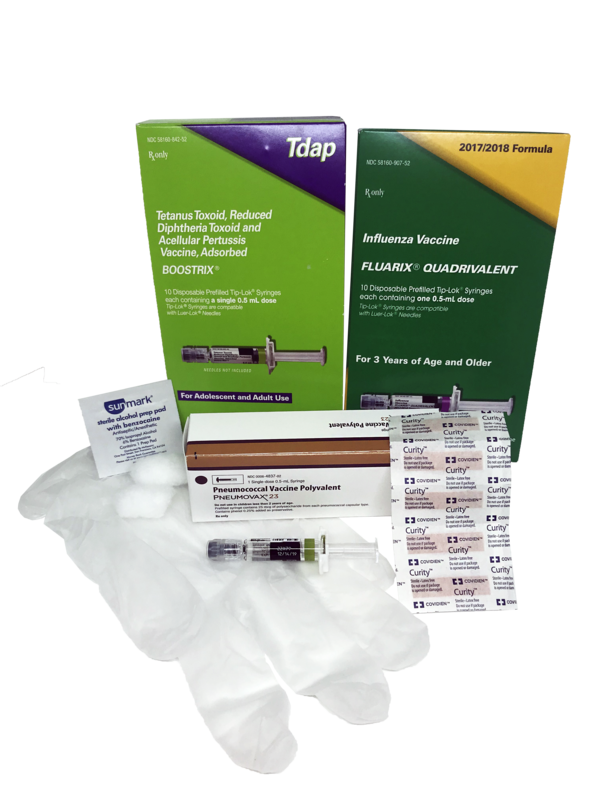 For only $1 a pack, the pharmacy can divvy up all of your medication doses for you. You can have the pharmacy add vitamins into your blister pack to take one more thing off your mind. However, remember that the pharmacy legally can only fill blister packs with medications filled at the Lee’s Pharmacy. 5- The last, and possibly most important lifehack for pharmacy is delivery and curbside pick up. When life gets busy, and especially when you aren’t feeling good, you can opt for your medication to be delivered to you. Currently, Lee’s pharmacy is offering free medication delivery within a 15-mile radius. Just call in and opt for curbside or delivery on your next prescription. Ask your pharmacist for more information about which of these lifehacks will work for you! Talk to your pharmacist about Med-Sync. 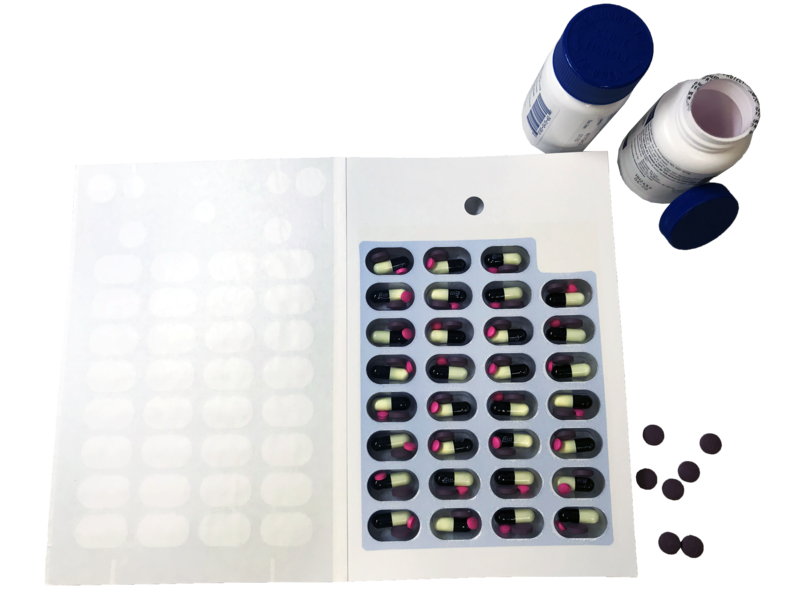 This is a free service that is set up within the pharmacies system that allows you to pick a day for all of your prescriptions to be filled. This means that you only have to stop by once for all of them! It’s like synchronized swimming, but for your meds. 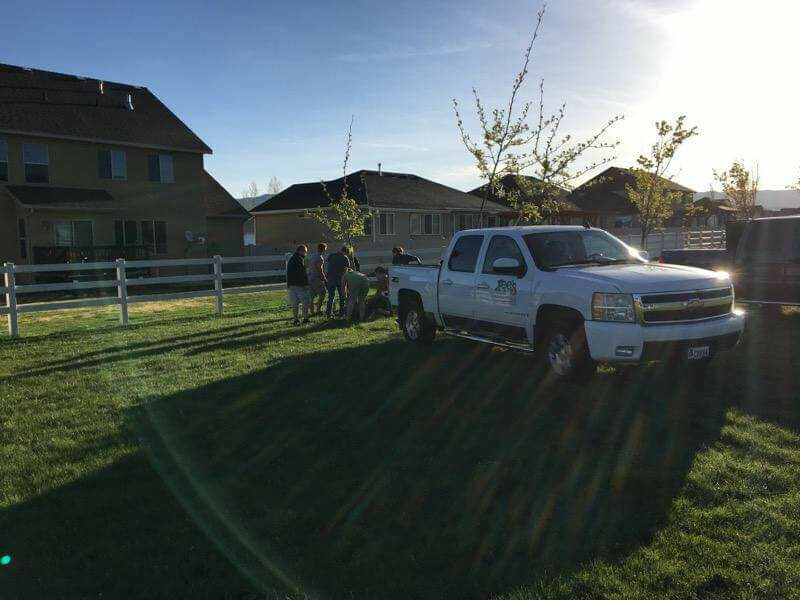 Throughout April and May, Lee’s coordinated with their local cities to plan and execute the Lee’s Trees project. 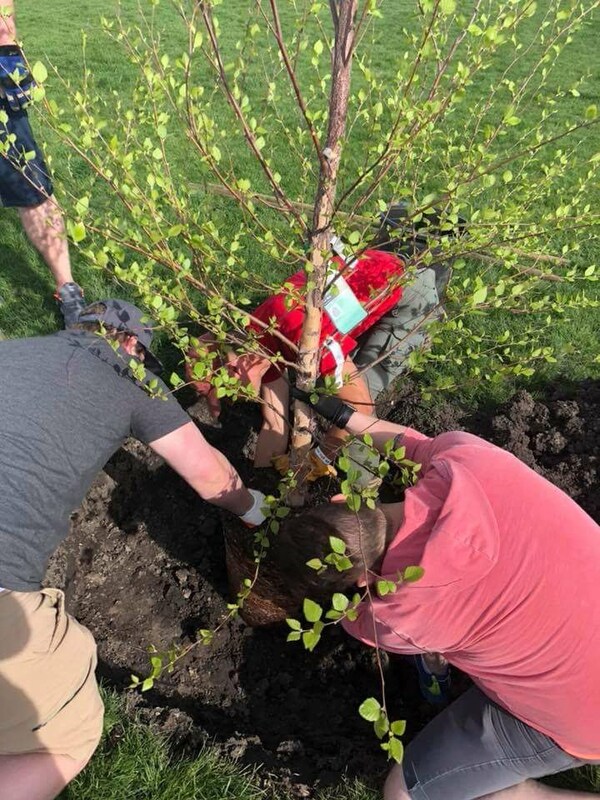 This program donates trees to the cities surrounding each location and supplies volunteers to plant them. Every time Lee’s guests use a reusable shopping bag they can earn a wooden nickel through the check stand. These wooden nickels are then deposited into a Lee’s Trees box, which is counted periodically during the year. Once spring arrives those nickels are totaled and the donation process can begin. Select cities surrounding Lee’s locations are chosen to receive the donation of trees. The wonderful personnel at the cities help to coordinate and plan this project. Each city was able to order 5-6 trees according to their preference and determine where they were needed most in the communities. Once that was determined the store scheduled a day when Lee’s Team Members could volunteer hours in their community to aid in planting. 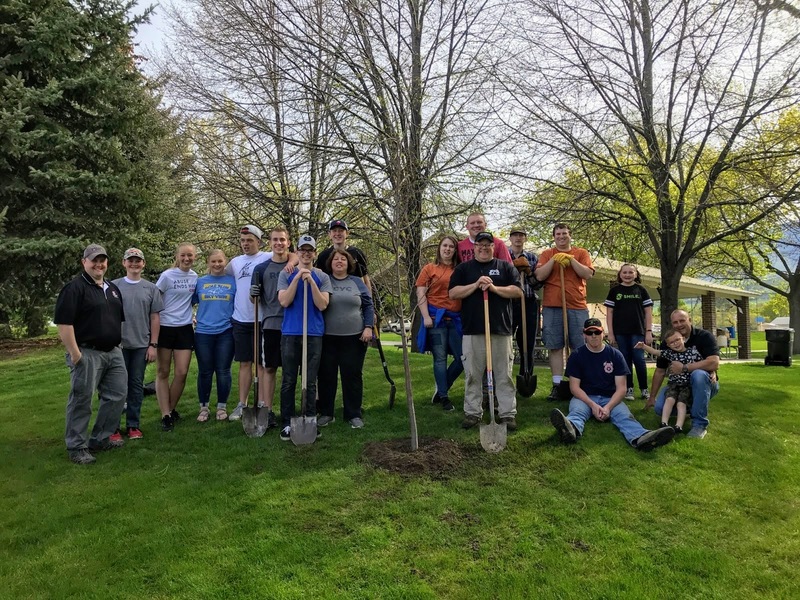 This year Lee’s Partnered with Comcast Cares Day in Smithfield, Richmond’s Citywide Arbor Day Clean up, and North Salt Lake City’s Arbor Day. This is a wonderful opportunity for Lee’s Team Members to partner with the communities and help beautify and brighten the places where we live and serve. Lee’s wants to thank all of the loyal guests who help their communities and environment by bringing in reusable bags. 5-Gifts to Say Thank You to Your Mom! Our moms are amazing people. The real-life superwoman in our lives. They have been there during some difficult times, some happy times and have loved us through and through. They do a full-time job in our lives and ask for almost nothing in return. There is a special connection between a mom and her child, she has a specific ability to know what is needed. To know when she needs to comfort, to reach out with a loving hand, to protect, and to encourage. For our mothers or our mother figures in our lives, reaching out to them and saying thank you is important. You want more than anything to express your love, gratitude and the importance they have had in your life. Here are 5 ways that Lee’s can help you say thank you! 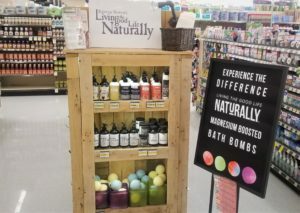 Bath Bombs and lotions are always a good option if your goal is to pamper your mom. 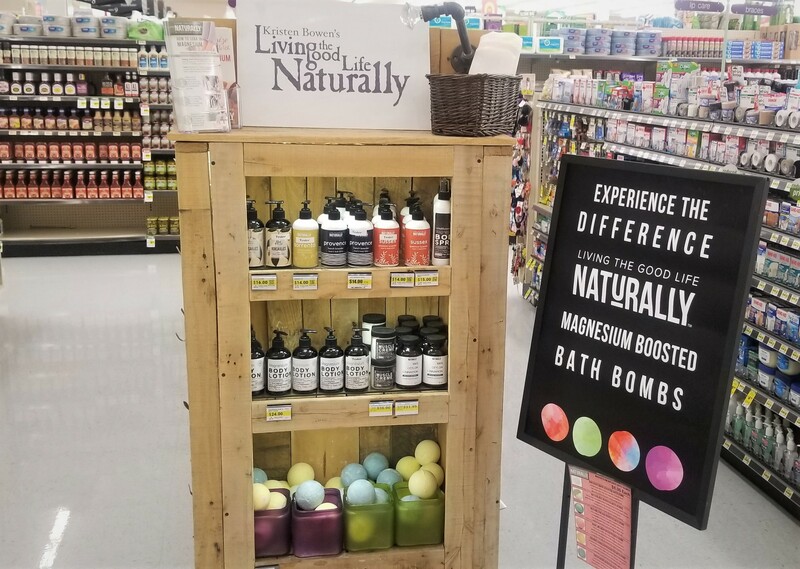 However, if you buy a Living the Good Life Naturally bath bomb, you will get magnesium boosted enjoyment. They use only the cleanest and purest magnesium on earth. Magnesium has extensive health benefits, but what you will notice is the refreshed feeling you will have afterward. These bath bombs are also infused with the best cocoa butter, essential oils and more to leave your skin smooth, moisturized and relaxed. Also, don’t forget about the magnesium soak, body spray, muscle creme, and body lotion to help your mom have a relaxing and revitalizing mother’s day. Lee’s Corner Floral Designers are there to help create the perfect options to celebrate mom! Order over the phone, in-store or online for pick up or delivery. The Floral Department is a fully custom shop, which means you can get a specially made floral arrangement for your mother, every time. Lee’s high quality hanging baskets are ordered directly from Rudy’s, Northern Utah’s local nursery. 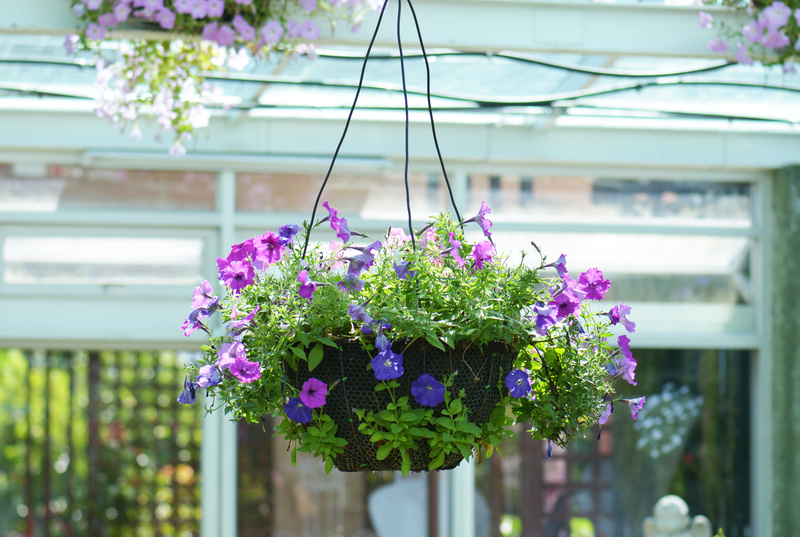 There is a large selection of tons of different varieties of hanging baskets, color bowls, assorted planters and garden plants available. Hanging Baskets are a long-lasting gift that can brighten up an entry-way or patio creating a lovely view for you mom. Some of our moms appreciate the finer things in life: chocolate and sweets. At the grocery store, there are so many options for her. 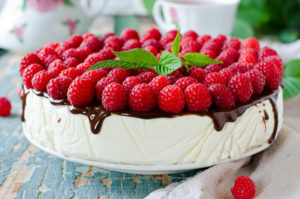 You can get assorted chocolates, fresh made-from-scratch cakes, ice cream, cheesecakes, eclairs, and more. The talented cake decorators can even design a perfect cake for you, using a fun image, drawing, or a thoughtful note. Lee’s can help you create a delicious, fun treat for your mom that is special for her. Treat mom to a delicious dinner. Our meat department, produce department and grocery department have a large array of high-quality ingredients to make a decadent, made-from-scratch dinner. Or, if you love your mom, but lack of cooking skills, there are quite a few tricks Lee’s can help you out with. Ready. Chef. Go. is a great meal with seasonings, veggie, and protein already packed in a steam-able container. You can put these in the microwave, (yes, delicious food in the microwave) and you have perfectly steamed food, ready to go. The produce department also makes your life easier, with pre-cut, pre-seasoned veggies, fruits and ingredients, your prep time will be cut in half. Try Lee’s stir fry mix, veggie grill mix and more. #LeesLifehack: order all of your mother’s day treats and flowers ahead of time for a stress-free, relaxing mother’s day for everyone! On Wednesday and Thursday (May 2nd-3rd) this past week, Lee’s participated in Bridgerland Applied Technologies Career Days. This is always such a fun experience for our team members to go to as well as the hundreds of 7th graders that attend each year! With a high percentage of jobs available in Utah that do not require a bachelor degree, technical skills are needed. Bridgerland does a wonderful job at spotlighting many of the careers available. There were presentations from many technical jobs throughout the valley from Heavy Equipment Jobs and Trade Jobs. Since Lee’s Marketplace is a scratch and made-fresh store, there are many jobs and careers available within. At the career fair, two of our amazing team members spotlighted the bakery department by doing a bread loaf-making contest. Contestants could roll out the dough, and attempt to make the best looking loaf, ready to bake. This is always a fun experience, to be able to spotlight that a career with Lee’s is a possibility in someone’s future. Many of the team members who work at Lee’s can celebrate anywhere from a few months to 37 years at Lee’s, since the company’s start in 1981. 1-Guest Services: Every team member position at Lee’s is a guest service position. Yet, there are specific jobs that specialize in helping every guest that walks through the doors. Service Desk Personnel: They help with specific issues, orders, pickups, balloons, licenses, etc. Cashier: Cashiers help guests check out their products, and are the friendly face at the end of the shopping trip. Courtesy Clerks: On top of bagging groceries, courtesy clerks help guests to cars and help with carts. Demo Clerks: Demo clerks get to sample products and help guests to know about new products and varieties. 2-Operational Positions: These positions help the store run smoothly, help shelves remain stocked, and the store remains clean. Freight Crew: Helps to stock shelves, build displays, and move product throughout the store. Frozen, Dairy, Deli, Produce, Floral, Bakery, and Meat: Work on stocking and preparing the product in each of their specific department. Cleaning Specialist: Works on keeping the store clean and in the best shape possible. Bakery & Meat Clean-up: Cleans the departments and meticulously sanitize and get the department ready for the next day’s work. Administrative positions: These help the store to run on a behind the scenes basis. 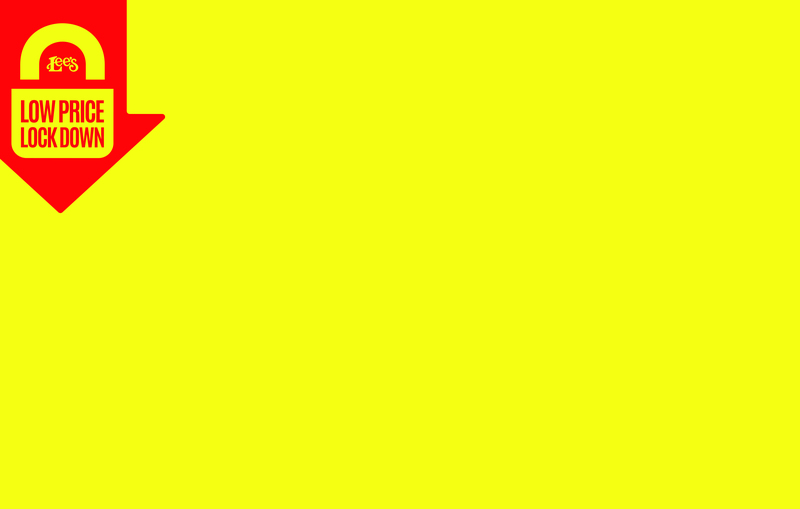 They make sure that the everyday work and flow can continue forward. Bookkeeping: Make sure that sales and other things are reported correctly in the system each day. Human Resources: HR controls the hiring process as well as every day of flow to help the team to have all of the resources to be a safe and fun work environment. Accounting: In the Management office there are accountants that help to make sure that vendors are paid, sales, profit, and money is balanced throughout the company. Marketing and E-Commerce: With the growing usage of social media and online sales, there is a team that works behind the scenes to make sure that Lee’s sales and pricing are out and accessible. Specialty & Technical Skills: Some of the positions at Lee’s require special training and experience to be able to perform. Although many of these positions don’t have a high turnover rate, they are a wonderful career possibility in the future. Meat Cutter & Wrappers: They are highly trained butchers who work in the store every day with the highest quality meat possible. Fresh Cut Clerk: They are there early every morning making the fresh salsa, cutting vegetables and fruits, and making freshly squeezed juice. Donut Fryers: They come in long before the sun rises to fry and glaze the legendary Lee’s donuts each morning. Scratch Bakers: They are in charge of making all of the loaves of bread, rolls, and Lee’s artisan bread, working throughout the night to have fresh bread ready each day. Cake Decorators: Decorators spend hours meticulously designing and decorating delicious cakes for birthdays, events, weddings and more. Floral Designers: Designers create custom arrangements for each and every orders as well as creating event options for large parties and weddings. Online Sales Clerk: These personal shoppers will scour the store for the best quality items for each order and then deliver them directly to your door. Pharmacy Tech: After schooling, these techs assist the pharmacist in filling all of the prescriptions that are ordered through the pharmacy. Pharmacist: These highly trained and certified Pharmacists help to make getting medications, vaccines, and tests a stress-free, enjoyable experience. 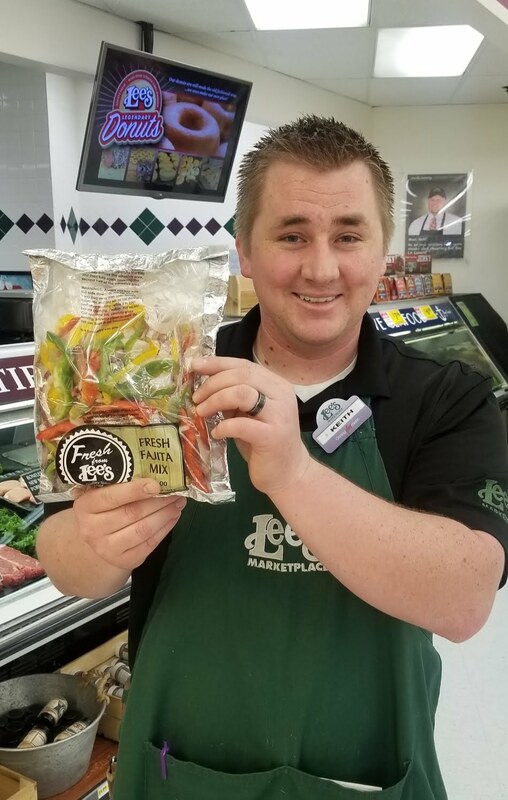 5-Managers: If you have a knack for management and leading, there are many different opportunities at Lee’s for someone who wants to tailor their leadership career to a focused specialty. Follow Lee’s on Facebook or check at www.leesmarketplace.com for current job openings throughout our 5 locations. 5 Reasons Lee’s is your one-stop wedding shop! It’s the biggest, most important day of your life, or at least that’s what the stories say. You are getting married! And you are ecstatic and constantly shifting your ring so it hits the light just right. Yes, it’s an exciting place to be in. Your entire future ahead of you, big decisions to make, and the biggest party you will ever host, still needing to be planned. Now, don’t get overwhelmed. Picking vendors, designers, and others can seem to be a huge undertaking. And by all means, once you have them picked, you still have to coordinate details before you order. And once that is done, you have to coordinate pick up or delivery, and more. Yes, it still sounds like a massive hassle to tackle when all you want to do is wallow in excitement and daydreams. Well, lucky for you, Lee’s Marketplace has a lot of experience taking on the planning details for big days. This means you can turn it over to the professionals, and relax and enjoy the ride. 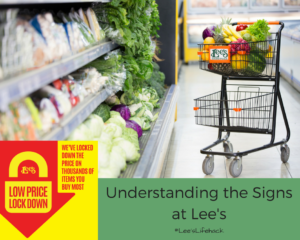 Now, when you think of Lee’s you think of good food, groceries, well… a grocery store. What you may not realize, is that there are a few secrets Lee’s is dying to share about weddings. 1- Lee’s Corner Floral Shop: Something you may not have noticed about Lee’s floral department, is that they run exactly like a floral shop. Essentially that is what they are, a fully-functioning floral shop located within a grocery store. Which also means, that pricing can be more competitive, because it doesn’t have to lease its own building. So your dollar goes further at Lee’s. Lee’s hires on florists with plenty of event and designer experience. On top of that, Lee’s trains all floral clerks thoroughly giving them the experience they need to have that professional touch in any event order. 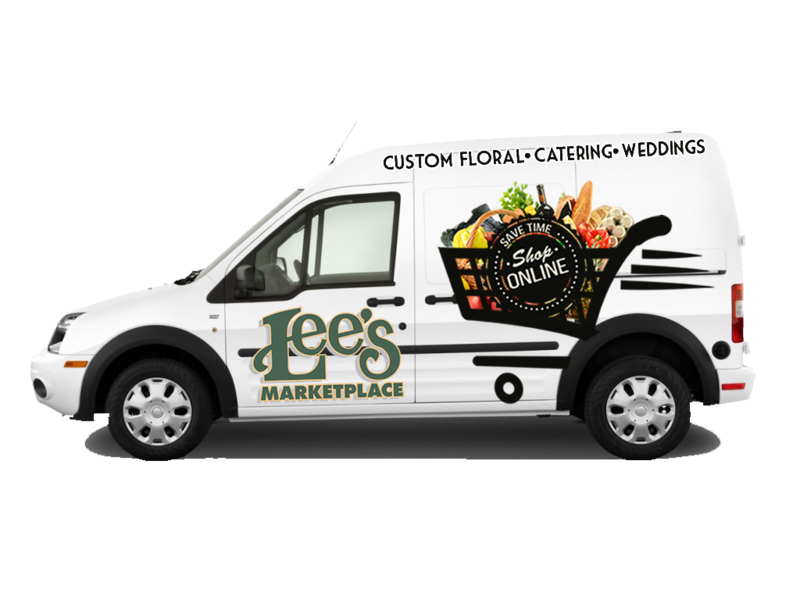 As a company, Lee’s Floral does hundreds of weddings a year. These orders can be small & simple with just a bouquet and boutonniere, to large centerpiece and archway orders. All of the flowers are purchased through the same vendors and brokers that other floral shops use. These flowers come from growers across the globe: Columbia, Holland, Hawaii, California and more. 2-Cake Decorators: Lee’s Scratch Bakery has amazing cake decorators. These decorators have years of experience on their side, making meticulously gorgeous wedding cakes. They get a lot of experience on all of the trends each year. There are some weeks where they are designing multiple wedding cakes with completely different styles. The great thing about these decorators is that they understand that how the cake tastes are sometimes more important than even how it looks. Who wants the most beautiful cake in the world if cardboard and sponge get shoved into your face at the end of the night? No, one! That means that these decorators have become skilled at using buttercream frosting instead or pairing it with the fondant for a flavorful cake. Now, all of this is on top of Lee’s amazing cakes. Lee’s cakes are moist and chock full of wonderful flavors. So you will get a tasty cake, that looks gorgeous, and a price you won’t choke on! 3-Catering: Okay, now to the subject we all really care about, it’s near and dear to each of us. Food. Okay, but really, trying to find the food that both the bride and groom can agree on, as well as the entire wedding party can be a touchy subject. Wouldn’t it be fantastic if you could customize a dinner selection and build it from the entree up? Good thing you can. Lee’s Deli offers a large variety of catering options, and many more unique offerings available. These are paired with made-from-scratch bread from the bakery department and make an amazing assortment. You can get anything catered. From party trays to assorted veggies and fruits. There are dinner options such as lasagna, prime rib, chicken, and more. You can do a nice simple sandwich available in a party sub, or a sandwich tray. Bottom line is, Lee’s Deli, has you covered. 4-Desserts, Popcorn Bars and More: Okay, treats, snacks, and stuff you can nibble on will be lifesavers at your wedding. Hiding a bag of popcorn behind your dress is much easier than hiding an entire sandwich, and at some weddings, that’s all you will have time for. If you want desserts that taste amazing and are made from scratch in-store every day, Lee’s bakery has it. A popcorn bar is a cute and trendy and a light way to feed all of your amazing friends and family. There are quite a few delectable flavors for you, sweet, savory and salty. #Leeslifehack: Depending on your colors, you can even tailor the popcorn to match your decor. Try a donut bar if you want to really impress your guests. What can smooth over any stress or drama better than savory, melt in your mouth, made from scratch donuts? And sometimes, it is actually to reward yourself, your bridesmaids, groomsmen and parents with a delicious ‘thank you!’ at the end of the night. 5- Completely Customizable: Here is the great thing about having Lee’s be your one-stop shop for everything, is that all of what you order will be made fresh in the store. This also means that you can include specific preferences, requests, etc. You aren’t trapped by a package order and barred with ‘that’s not included in this package’. If you have 16 groomsmen and 3 bridesmaids, done! If you really want your deserts decorated with gold and to sparkle, done! Your wedding can be as unique as you, and your love story. Bring your personality, favorites, and perspective to your wedding. Make it a day to remember! #LeesLifehack: Schedule a free consultation in advance to ensure a designer is ready and prepped to meet you, the cake is ready for tasting, and a list of seasonal catering options are ready for your choosing. Bring in your Pinterest pictures (we know you have them) and those color samples (yep, we know you have those too). It helps as well if you have quantities you are expecting and totals ready. This will make the quote you get at the end of your consult as accurate as possible! Trying to save money for your family can be difficult, and figuring out what will be the best deal will be can be a struggle. Lee’s has many different pricing programs that help to keep the pricing low. 1- Low Price Lockdown: Low price lockdown is a program that drops prices on seasonally appropriate and frequently shopped items. This means that the items you will look for most, at the times you will look for them, they will be on the best deal they can be. 2- Weekly Ad Signs: Weekly ads go from Tuesday to the following Monday each week and include competitively priced items. 3-Weekend Ad Signs: Weekend Ads ring in low “market leader” pricing and lock the prices over the weekend. 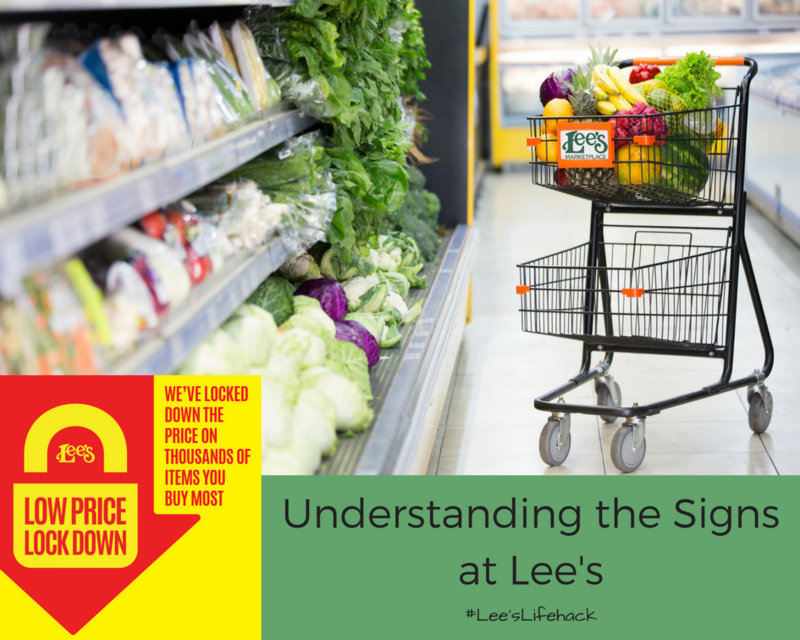 4- EveryDay Low Price: The everyday low price tags signify that Lee’s has lowered even more off the top of the most purchased items in the store, keeping with seasonal offerings. Rest assured that Lee’s is always finding ways to keep their pricing competitive and low on the products you and your family enjoy. #LeesLifehack: Follow Lee’s on Facebook and Instagram for access to the Weekend Ads, and check at www.leesmarketplace.com for the full AD each week.